Anyway, the installation went off with a hitch but I did encounter some annoying problem while trying to update apps from the Google Play Store. I kept running into the RPC:S-5:AEC-0 error which barred me from any sort of downloading regardless of whether the app was a fresh install or an update. After some Web searching, I found this post at Android Central which cleared the error. It might not work for everyone but it did for me. Now I’m facing the problem with the Play Store intermittently refusing to display screenshots or show their enlarged version. Loading up product pages can lag a wee bit as well. I’ve yet to read up on what the cause might be for this since it’s not that urgent of an issue. Oh yes, while the build linked at the Galaxy Tab Hacks site is more or less stable, it seems that USB charging is no longer a sure thing. It didn’t charge for me earlier but it’s doing so now. It will also run into the “Unfortunately, < app name > has stopped” annoyances now and then with the camera and the Torch apps. It might do it with some others too but I haven’t used any apps for extended periods of time since I installed 4.1.2. However, I have been spending some quality time with both Apex and Nova Launchers. Initially, I was going to commit to using Chameleon. I mean, considering I shelled out money for it during its Kickstarter campaign, it only seemed appropriate that I would finally use the thing. Unfortunately, even after so many updates, it STILL doesn’t completely suit my needs. I need shortcuts on my home screen since I don’t want to have to dig through the drawer to get to the app I want to use. I have everything categorized into little folders via Auto App Organizer and while I can certainly add each folder as a widget onto the home screen, it makes for a goofy looking, fairly unattractive layout when placed with the native Gmail and calendar widgets. There also doesn’t seem to be any way to increase the space between app shortcuts in the dock which only adds to the overall silly look. Don’t get me wrong; Chameleon is a gorgeous launcher but it’s only like that if you use specific widgets (as seen in the images on their site and on the product page at the Play Store) and not cram the dock with 8 or 9 shortcuts. Despite it not being the launcher for me, I don’t regret contributing to its funding. I added the theme name and designer myself. 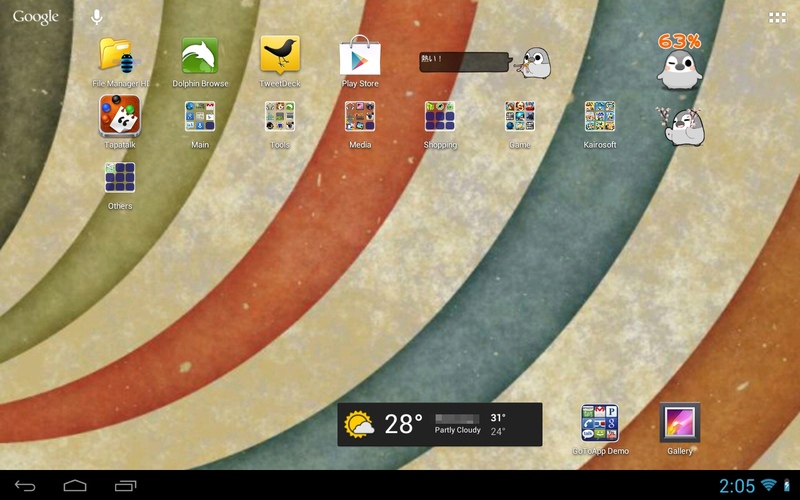 The wallpaper is a modified version of this: http://simpledesktops.com/browse/desktops/2011/jun/30/maru/ And the icons with category labels are from the aforementioned Auto App Organizer. I’m currently using the Plate Theme and have since moved the shortcuts icons a bit higher. ^^ Note that you don’t need root to use any of the launchers or themes I mentioned.